Soft-tip ultra light weight MAXX Menthol disposable electronic cigarette. When it comes to smoking and flavor, menthol is no doubt one of the most popular choices. It remains a bestseller, even for electronic cigarettes. 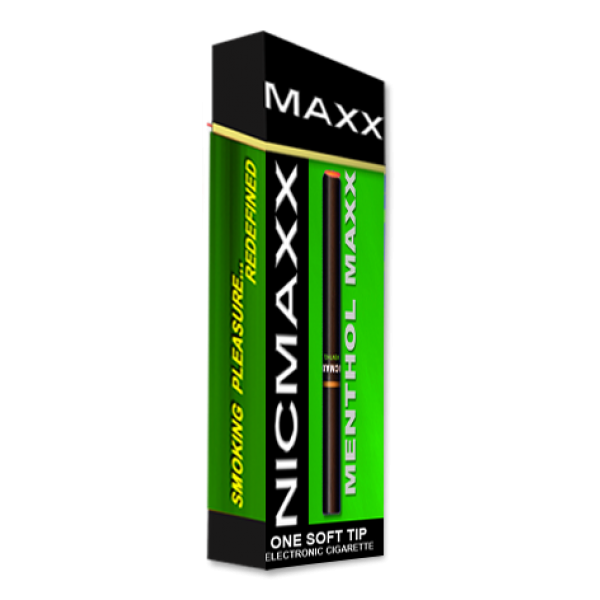 NICMAXX offers menthol e-cigs that can give you full nicotine satisfaction with fewer harmful chemicals. Smokers who want to quit but can’t resist nicotine can switch to electronic vaping devices. Vapes, or e-cigarettes, are popular and safer alternatives to regular smoking. E-cigs are available in various online e-cig stores like NICMAXX, and cost less than tobacco cigarettes. E-cigarettes provide the same nicotine hit as tobacco, using a battery-powered device that emits vapor instead of smoke. This device allows people to “smoke” in public places such as restaurants and pubs where cigarettes are prohibited, since vapor from e-cigs is less irritating than secondhand smoke. Vaping is believed to be a less toxic way to enjoy a nicotine rush. Smoking tobacco involves the combustion of thousands of harmful chemicals, forty of which are confirmed to be carcinogenic. Vaping, on the other hand, creates vapor by heating an e-liquid that gives the vape its unique flavor. Menthol is a refreshing flavor that adds a cool note to the nicotine rush from tobacco. NICMAXX mixes this cool and spicy taste with tobacco flavoring to simulate the experience of smoking a real menthol cigarette. We offer menthol vapes in strong and mild concentrations to satisfy the unique craving of every customer. Making different flavored vapes is a popular trend among companies. Vape News Magazine reports that there are more than 7,000 flavors in the market, from 450 e-cig companies. NICMAXX relies on extensive research and customer preference in mixing the right flavors, and we don’t let experiments with flavors get the better of our e-cigs. Instead, we stick to what e-cig users love, and what they look for when they vape: bold flavors and a deep lung and throat nicotine hit. Making the smooth transition from tobacco to electronic is easier with the right flavor combination. 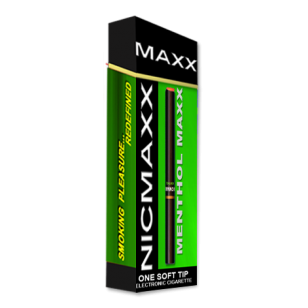 At NICMAXX, we offer the best-tasting menthol vapes with full tobacco flavor. These vapes let you have the closest experience to smoking a real cigarette, minus the harmful chemicals that come with burning tobacco. Discover a better, alternative way to consume nicotine with NICMAXX. We have been making e-cigs since 2007, and we continue to develop our products to better satisfy your vaping needs. Cool down with menthol vapes by NICMAXX. Find out why our e-cigs are preferred by 9 out of 10 users. We offer free shipping for orders over $75!